I painted this hedgehog at Secret World Wildlife Rescue (SWWR) in Somerset, which does a wonderful job rescuing and nursing back to health injured and sick animals and birds, hand-rearing baby onesand releasing them back into the wild. Hedgehogs are down in numbers from 30,000,000 fifty years ago to only 1,000,000 today. Such a catastrophic decline of a much-loved and once familiar animal shows there is something fundamentally wrong in the way we are treating our environment. Our mistakes also affect the rest of the web of life in this country: hedges are pulled up and gardens paved over to make parking space for cars. Gardens are fenced off, stopping hedgehogs roaming through their territories in their search for food. Slug pellets and insecticides are overused in allotments and gardens, killing the food supply of hedgehogs and many other birds and animals. To help hedgehogs, plant new hedges and wildflower beds, make access holes in fences, stop using slug pellets and insect killers and let your gardens grow wild!! As so many British animals and birds are disappearing at an alarming rate, it is vital we reconnect our children with the natural world and all its wonders. In an age of virtual reality and the seductive power of computer screens, this is both very challenging and essential. The decline of hedgehogs and so many birds and insects is so rapid that a massive change in our behaviour is needed. Hedgehogs, along with song thrushes and so many other small birds, fall victim to the excessive use of slug pellets and pesticides in our gardens and allotments. It has to be remembered that as we kill these insects and other invertebrates that feed on our flowers and vegetables, we are also killing the creatures that naturally eat them, the hedgehogs and birds. This message has to be repeated, as no doubt most gardeners and allotment-keepers also lament the disappearance of our much-loved and once-familiar garden animals and birds. 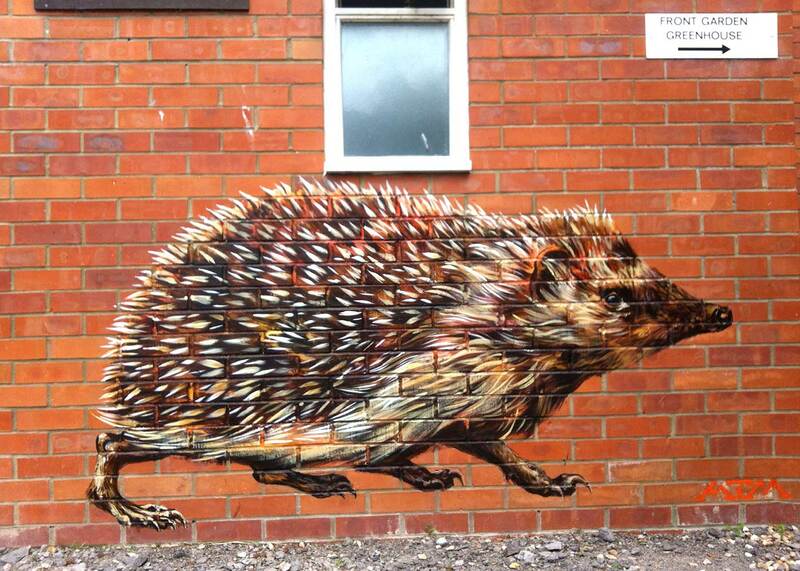 A big wall painting of a hedgehog in this very public place will be of great appeal to children, it will inspire them to think about hedgehogs and encourage them to ask questions about them and what they need.